Hello parents/families/carers! We welcome you back to our blog after this festive break. The festive season can induce a mixture of feelings- happiness, sadness, worry, anxiety, stress, the list goes on! And at the beginning of a new year it is a good time to set an intention for the following months ahead. Now the point of this post isn’t for you to figure out what that may be right now, write a list and ensure that you stick to it! Oh no. Rather, we just wanted to bring your attention to the importance of play and having fun with your child as a suggestion for something to be aware of, and also something which can benefit you both! What are your fondest memories of being a child? I know mine were the times I was playing either with friends, or family, and having fun with them. They are the memories that stick with us which, obviously one reason being that having fun is what being a kid is all about! But the other is the importance of play for development. Play is a way in which children can learn through using their imagination, open up their creative minds, and explore different scenarios, characters, and fantasies, alongside developing their physical, emotional, and cognitive awareness. It is also a method for testing boundaries, just as we see animals in the wild pretend playing and fighting, they are doing then same thing and preparing themselves for what is to come as they reach adulthood, and practicing within the confines of their safe space with their brother, sister, or parent. The importance of children’s play with adults is that adults can assist, especially in the early years, to develop language and social skills, by interacting with a child at their own level. Get coloured scarves and dance around to some upbeat music. Make some musical instruments with a water bottle filled with rice/beans/sugar etc.. Watch a video on how to here. Yoga dice- a great way to help slightly older children get creative with poses and creating their own short flow sequences. 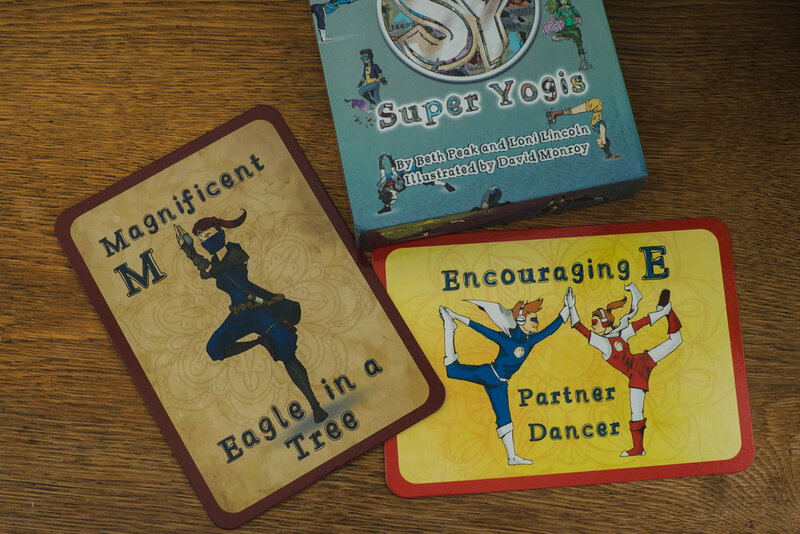 Featured Yogi Prop- Super Yogi’s flash cards! We at HERE love these cards and I use them regularly in my classes with slightly older children. They are a beautifully illustrated set of 32 cards which are geared towards boy and girl yogis through super heroes! What makes them such great yogi cards? They give a little more than the others I have seen and used before. For example (in the name of fun) one of my favourites is the Magnificent M Eagle In A Tree pose! Which explains on the back there is fun to be had in making up and combining new poses, so encouraging creativity and play within the practice. Another favourite is the Encouraging E Partner Dance pose. I am yet to come across a child who doesn’t enjoy this pose! It’s fun, encourages team work and balancing, and Super Yogi’s write on the back how it is tricky to do things on your own sometimes, so having someone to support you, or supporting another, can be helping and encouraging. See a link to buy them here. All of these cards, poses, and activities can be used between you and your child and also for your children to try out with each other. Why not use this form of play to encourage team work, encouragement, creativity, physical development and time together? There are a lovely array of relaxation poses too to assist with emotional resilience and the importance of teaching your child to slow down and reconnect with the breath. You’ll be surprised at how young children can understand and practice this now! I am amazed every time I teach little ones. We at HERE are all about sharing what we love about yoga and mindfulness for you and your little ones. Also, feel free to explore our site and our activities and things we love sections with more ideas on how to bring mindful practices into your own home with your family. Whatever intention you set, don’t be too hard on yourself if you let its go at times, just remember to have fun with each other and create those memorable times together.